Two faves in one! 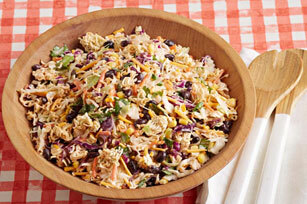 Taco salad and crunchy ramen noodles come together in this super salad. Mix dressing, cayenne pepper sauce and lime juice until blended. Break Ramen Noodles into large bowl. Discard Seasoning Packets or reserve for another use. Add dressing mixture and remaining ingredients to noodles; mix lightly. Prepare using Kraft Three Cheese Ranch Dressing.